The summer the Smithsonian’s National Museum of American History opened a new wing dedicated to business and innovation. One section of it, the Patrick F. Taylor Foundation Object Project, explores how certain consumer goods — clocks, ready-to-wear clothes, refrigerators — both drove and embodied social change in the US. Bicycles, for instance, gave women a whole new independence of movement and helped support the Victorian dress reform movement which sought to liberate women from the restrictive fashions of the day and advocated less binding, less bulky, more practical garments for use in sports and activities like swimming or bicycling. 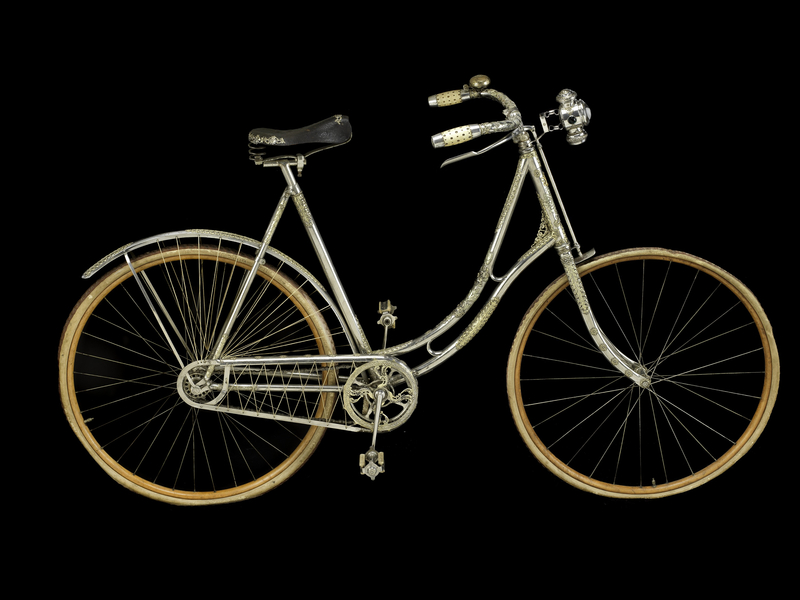 One of the pieces on display is a sparkling example of the roles innovation and fashion played in the bicycling craze of the late 19th century. 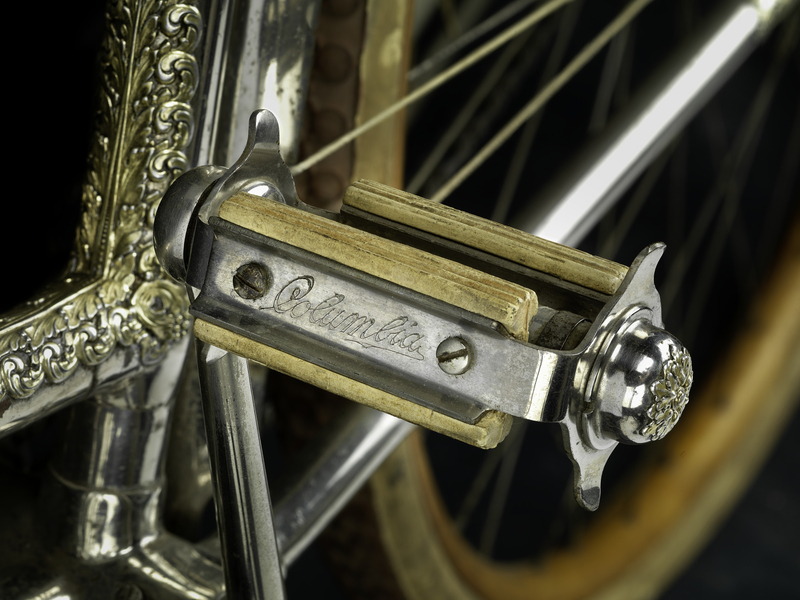 It’s a Ladies Columbia Bicycle made in 1896 by the Pope Manufacturing Company at its Hartford, Connecticut, factory, then the largest bicycle factory in the world. It was a safety bicycle, so-called because unlike its predecessor the penny-farthing, it put pedals close to the ground for easier balance and stopping and had a chain-drive that allowed for much smaller wheels. By 1896 those wheels were inflatable pneumatic tires which gave a much smoother, faster ride than the boneshaker of yore with its hard rubber tires. 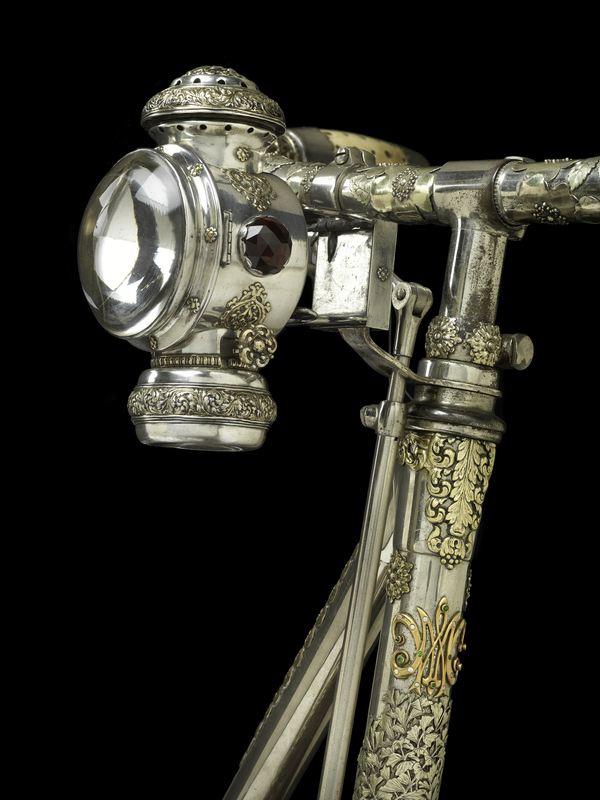 What makes this particular Ladies Columbia Bicycle stand out among the 60 bicycles in the Smithsonian collection is what happened to it after it came off the line at the Hartford factory: it was decorated with silver, gold, diamonds and emeralds by Tiffany & Co. Introduced in late 1895 for the Christmas shopping season, the Pope Manufacturing Company’s glamorous Tiffany Bicycle was more of a marketing tool than a big seller, and no wonder since it cost a prohibitive $500 before customization. 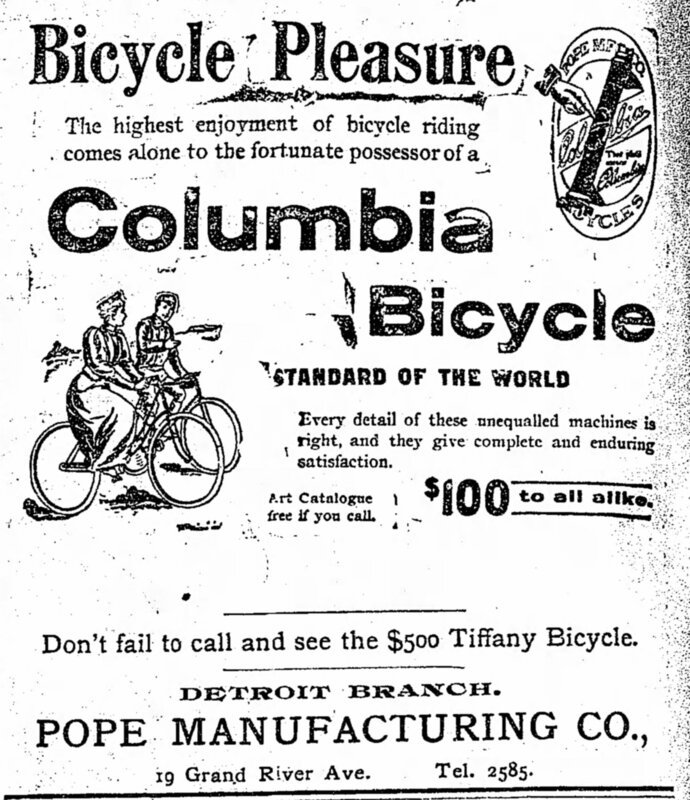 In its newspaper ads to Tiffany Bike was used as a lure to induce potential buyers to visit the company’s local branch where a wide array of affordable models were available for purchase. The Tiffany Bicycle in the Smithsonian belonged to Mary Noble Wiley of Montgomery, Alabama, wife of Spanish-American War veteran and United States Representative from the state of Alabama Ariosto Appling Wiley. The nickel-plated steel frame was decorated by Tiffany with floral and filigree designs in sterling silver covered with a thin layer of gold. 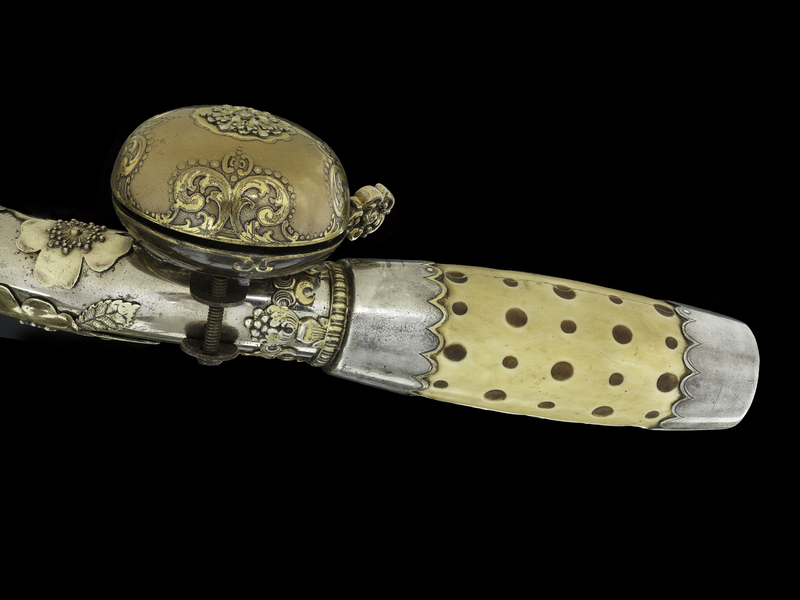 The handlebars have ivory grips with silver bands and gold embossed designs. The lamp is sterling silver with a rock crystal lens. The wheel rims are made of bird’s eye maple. To keep Mrs. Wiley’s skirts from getting caught in the chain and wheel spokes, twine was tautly threaded over them. Mrs. Wiley’s initials — MNW — were monogrammed onto the front tube in gold and studded with 12 small diamonds and eight small emeralds. Unfortunately we know very little about its creation and acquisition. Mary, known as Wiley gave it to her son Noble Wiley in 1915 to keep for his then-infant daughter Hulit to enjoy when she was old enough. Noble packed it away in a special bicycle trunk where it remained for 15 years until he had cause to unpack it and recall how awesome it was. He wrote a letter to Tiffany & Co in New York City asking for more information about it. That letter has survived, but alas any response he may have received has not. In 1950 he donated it to the Smithsonian Institution. It was selected for display in the Object Project and earlier this year conservator Diana Galante cleaned and restored it to make it ready for its closeup. She found that years of polishing had eroded some of the gilding, exposing the silver beneath to tarnish. The original rubber tires, whose sulfurous fumes played a part in the tarnishing process, were cracked and misshapen, a decay that is all but unavoidable in the life cycle of century-old natural rubber. After an initial cleaning to remove grime and old wax, the bicycle’s tarnish problem needed to be addressed. Galante used gentle abrasives to remove the corrosion returning the silver to its original shine. She coated the gilded areas were resin to keep them from tarnishing while on display. Visitors can see it now on display at the National Museum of American History in a custom enclosed display case (which will also help prevent tarnish while keeping this literal jewel of a bike safe), suspended in a mount specially designed to keep the rubber wheels from having to bear the weight of the bike. This entry was posted on Sunday, November 1st, 2015 at 11:45 PM	and is filed under Modern(ish), Museums. You can follow any responses to this entry through the RSS 2.0 feed. You can skip to the end and leave a response. Pinging is currently not allowed. Oh, I want one just like that one! I bet it would cost a lot more than $500 today. GoFundMe time! Both Lillian Russel and her pal Diamond Jim Brady rode diamond and jewel encrusted bicycles. Russel wanted to lose weight and she paired up with her good buddy and fellow gastronome to get some exercise riding the streets of New York City. Lillian, of course was the famous actress and Diamond Jim made a killing selling custom made Pullman railroad coaches. While not an “item” in the purest sense they were good buddies and Lillian trusted Diamond Jim to be a gentlemen, and apparently he was. The couple would go to Delmonico’s, the famous New York restaurant, after a show. The couple would make a grand entrance to thunderous applause. Jim, while large wasn’t really that fat, but he could really pack away the chow. What a spectacle they must have made. Do you know of any pictures of Lillian and Diamond Jim biking through the streets of Gilded Age New York? While I have no way of proving it, I’ll bet that is Lillian Russel’s bike. After reading about it, I have often wondered what became of it. Diamond Jim’s bike is out there somewhere too. What makes you think so? The Pope Company made more than one Tiffany Bicycle, so Lillian Russel could well have had one of her own, assuming hers was also a Pope. Also there’s no evidence Mrs. Wiley’s monogram was added years after the bicycle had been in use. 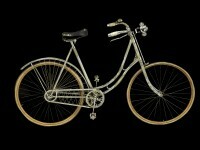 The bike and its decorative elements were all manufactured around the same time.